Absolutely no returns will be accepted on clearance items. All shipments are packed with great care by experienced packers using standard approved packing methods. As all shipments are FOB our warehouse, transfer of ownership occurs when product is picked up by carrier. If any damage occurs in transit, do not refuse shipment, as this may incur unnecessary shipping expense and delay. File claim with your loss or damage. Carrier is responsible for breakage in transit. We will be glad to assist you in every possible manner in collecting your claim for loss or damage. 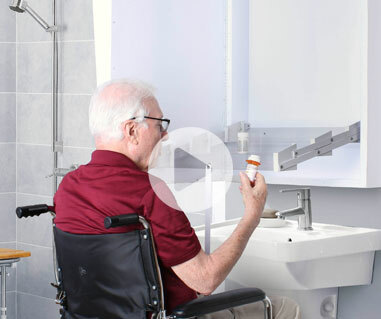 The Mirror-Lux Assist Medicine Chest is uniquely designed to allow the user to lower the interior shelving down to a comfortable level and contains an interior light. SHOP OUR CLEARANCE PRODUCTS! WHILE SUPPLIES LAST!